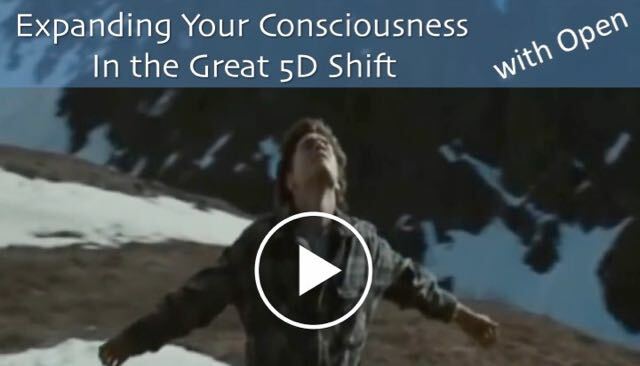 The Great 5D Shift gathers apace. And you're feeling it, in your relationships, your careers and general living circumstances. It's very challenging, pulling on all the connections into the old reality. It can generate fear, doubt and anxiety. Here's a short inspirational movie to encourage you onwards, to keep breaking down the old limitations and expanding through. It's a great production job Rich - thanks so much. I really enjoyed working with you on it! I look forwards to many more. I enjoyed it a great deal myself. The filming in such a location was awesome. And the editing etc was fun too. I do hope other Openhanders will enjoy it too. Above the matrix where heaven and earth meet! Brilliant video, Rich! Magnificent backdrop way above the matrix, atop a volcanic mix of shifting and expanding consciousness, fearless mountains busting through clouds of illusion, embracing heaven on earth! Thank you, Open and Rich, for this blast of inspiration. Open, I feel the power of your clarion call. "This is NOT the time to waver. Go for it." The comforts of the shire and outdated ways of being are fast unwinding. Everywhere I look in my 'old reality' domains these days, synchronicity beckons me to step up and help unwind misaligned energies. As within, so without. It feels like I can no longer shut the door and go back to bed. I'm feeling a mighty upsurge of warrior will arising from deep within. Also fear and anxiety connected to karmic memories, slithering tentacles wrapped around my heart, fighting to hold me back. I keep breathing the light of my soul through hyper-vigilant body cells; through fibers and tissues high on the alert; through my heart full of love and compassion; softening; feeling steely will merging with calm but fierce resolve and purpose. I continue to be inspired by all those courageous souls who did not waver. "Our worst foes are not belligerent circumstances but wavering spirits." Thank you Open, though...I feel this chaotic time is just as visceral for yourself as it is for so many of us. A great reminder for me as I sense the 'tsunami' edging closer yet I'm not needing to brace myself any longer. Such a liberating feeling! Wonderful feedback - makes it all worthwhile! Hey Guys - thanks for all the wonderful feedback about the new film - wonderful. Makes it all worthwhile! Thanks guys for all the generous comments. Very honoured and delighted to be taking the baton from Trinity. She has set the bar high (if I may mix my athletics metaphors ;b ) with such a wonderful collection of top quality work. It's been nearly 20 years since I did any video work. I'm looking forward to getting back into the creative swing with it. Wonderful inspiring video for these challenging and simultaneously liberating times of change - thanks Open! Great production Rich - fantastic job! Felt to expand a bit on my initial post above. So I plucked up my courage this week, sent those Greys packing that Open speaks of in his recent article, and stepped into the limelight to help realign a group energy I'm part of. Our community has been struggling for a while to shake off a leadership approach based on control, manipulation, and nuanced bullying, which has led to apathy, suppression of voice, and wavering wills. In stepping up and expressing, I made an appeal from my higher self to the higher selves of community members. The response has been miraculous! Others have joined me in committing to co-lead in a much more aligned way of being. We have challenges ahead because that's life, but I'm feeling the power of unwavering wills joining together. The tides are turning. What a joy to feel the backing of divine benevolence! THANKYOU, THANKYOU,THANKYOU, Open. Your words in the vid encouraged me very deeply! Just what I needed to hear. I am so grateful for this site, I really am. I'm crying with tears of gratitude.